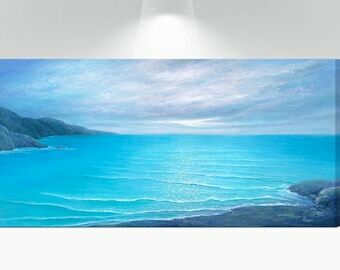 Are you looking for panoramic canvas wall art to hang above your bed or over your dining room table, living room sofa, or sectional? 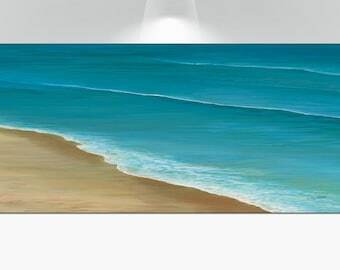 If you love the beach, this art work may be your ticket to enjoying it daily. 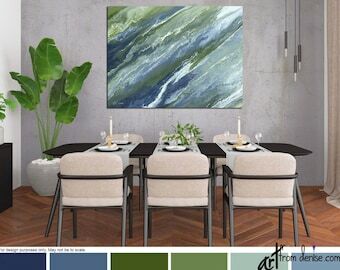 Well suited for coastal beach decor or a bachelor pad, colors in this seascape include softly blended shades of blue, teal, turquoise, aqua, sienna brown and white. Color proofs are available. Choose from small or large canvas print sizes up to the oversized 72" wide print. There's also a narrower version, which is listed further below under 'more options'. 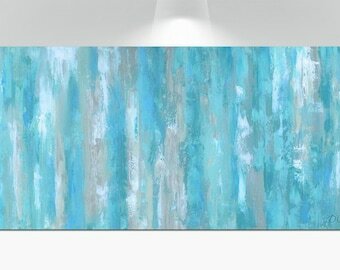 Canvas prints are made to order and ready to ship in 3-5 business days. High quality guaranteed. 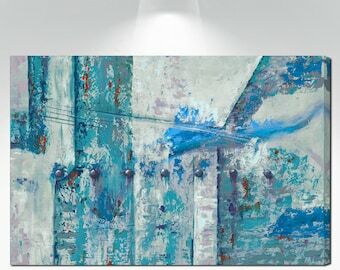 ☼ Medium: High quality giclée canvas print of original painting by Denise Cunniff. 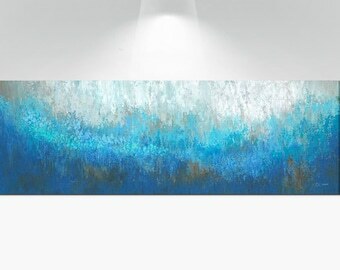 ☼ Finish: 1.5" deep gallery wrapped edges will be printed to match the front (mirror wrap) and satin varnish will be added to seal the artwork and protect your investment. No need for a frame - just hang it and enjoy. Hanging hardware will already be installed for you. 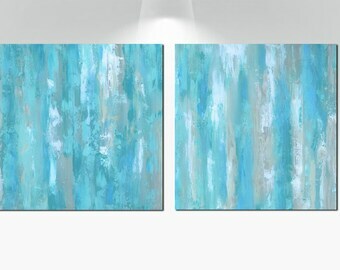 ☼ Your choice of canvas size (height x width): 8x24", 10x30", 12x36", 15x45", 16x48", 18x54", 20x60", 22x66", or 24x72". 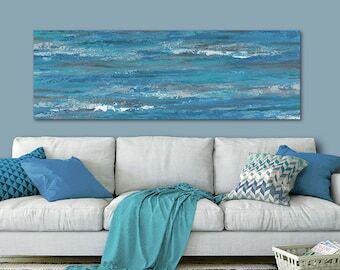 Canvas prints are made to order and considered a custom product, so if you're not sure which size is best for your wall you might want to tape together some paper to create a mockup of the size you're considering, and then tape that paper onto the wall. This will give you a good visual of how that size will work. If needed, add more paper until you determine the best fit. ArtFromDenise prints are made to order after your order is placed. No prints are kept in stock. 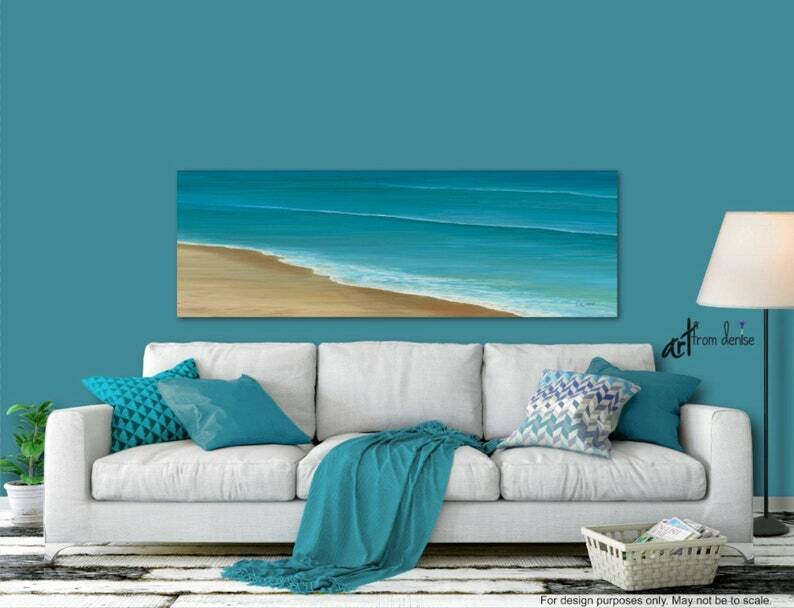 Your artwork will be created just for you in the size that you specify, printed with the art image you've chosen, and shipped within 3-5 business days. PROCESS: With ArtFromDenise, no shortcuts are taken, either in materials or in the love and craftsmanship put into each and every fine art print. 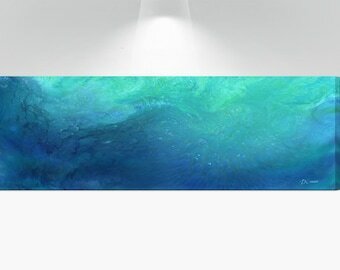 With the help of my expert production partner, your design will be printed with digital files of my original painting using giclée printing technology and fade-resistant archival inks, which guarantees vivid colors that will last for over 100 years. The high quality canvas is made of thick archival grade poly-cotton blend to provide greater durability, pH neutral, acid free, and will not yellow over time. 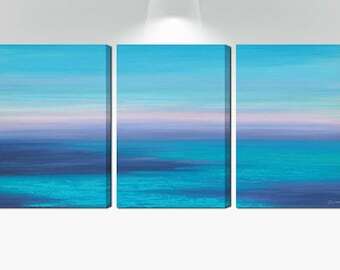 After printing, your canvas is tightly stretched and wrapped around the frame and stapled over kiln dried solid pine stretcher bars, ensuring that it does not warp or bow. 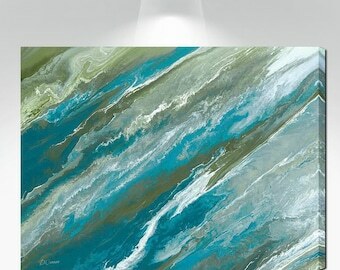 The corners are carefully folded to produce a neat finish in gallery wrap style. 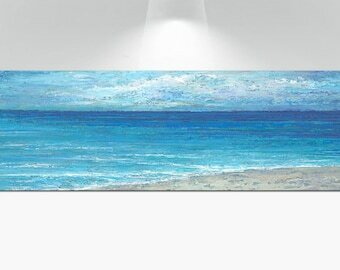 Your new art will then be varnished, dried and packaged in a sturdy custom made box and shipped to you ready to hang. You might also want to keep my shops in mind for hostess and wedding gifts. Because ArtFromDenise offers only custom made to order items, returns, exchanges, or cancellations are not accepted. Color proofs are available and an easy way to determine the right size is provided above. As mentioned, ArtFromDenise does not keep prints in stock. This ensures all customers receive a brand new item and it eliminates inventory costs, which ultimately allows this small art business to remain sustainable. Of course quality is always guaranteed, and if there's a problem with your order or an item is damaged during shipment, I will quickly take care of it for you. Please send me photos showing proof of damage within 48 hours of delivery. ► COPYRIGHT NOTICE: This image has been filed and is protected under copyright laws and may not be reproduced or copied in any way without a written agreement from Denise Cunniff. 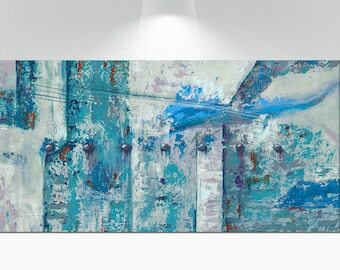 By purchasing this listing, you will own this one piece of art, but not the rights to reproduce it. Feel free to pin this listing to your pinterest boards! All I ask is that you include the credit “artist: Denise Cunniff - ArtFromDenise.com” in the copy description.